I remember a time when dining in Chinatown was the the thing to do. Yes, people other than tourists, would flock down to places like Ming's and Park Lok. Not really that they were great restaurants; rather they were the only places that you could get decent Dim Sum. Oh how times have changed. We now not only have Chinatown #2 in Richmond, it's more like an Asian City. I swear, it is the only place in the GVRD that I can totally forget I'm in Canada. 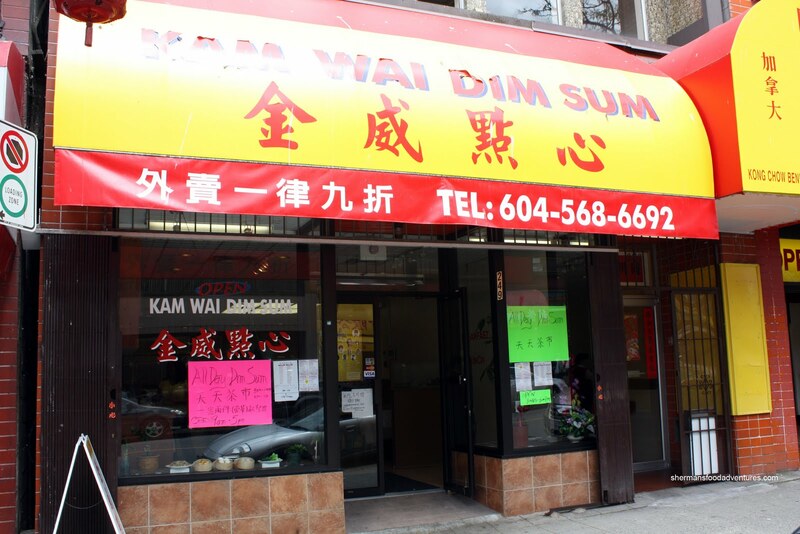 Furthermore, there are great places to get Dim Sum scattered all over the Lower Mainland. So, other than Floata, there is really no Dim Sum to be had in Chinatown. Mind you, I personally wouldn't even categorize Floata as an acceptable place to go other than there is no competition nearby. Until now. Okay, we are really comparing apples and oranges here. 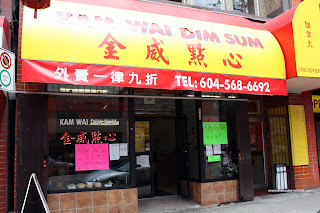 On one hand, you have Floata, which claims to be Chinese fine dining (which I think is quite funny) and then you have Kam Wai, which is your typical hole-in-the-wall. Whereas Floata can seat 1000, Kam Wai would be hard-pressed to do 50. But when we talk about what is really important, the food, Kam Wai wins hands-down. At first, I wasn't even sure if I found the right place while I was pulling into the adjacent parking lot. From the outside, it sure doesn't look like a place where I could get Dim Sum. Walking inside didn't really convince me either. It looks more like a simple HK-style cafe than a Dim Sum joint. But rest assured, they do indeed serve Dim Sum. Like many places these days, they employ a checklist to order the Dim Sum. It seems logical in this case since it is all day Dim Sum. They can't possibly push carts around for 9 hours a day. So I ordered too many items as usual starting with the obligatory Shrimp Dumplings. I gotta admit, these were pretty solid. Filled with perfectly cooked crunchy shrimp and a slightly chewy wrapper, these would not be out of place at a higher end restaurant. 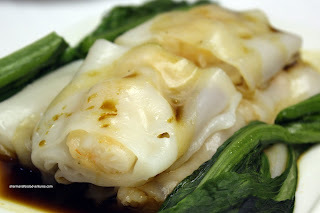 A little bit on the pale side, the Sui Mai were also very good. Consisting of pork and shrimp, there was a nice "bounce" texture to the meat. I liked how the seasoning on this one was not too aggressive. One of Viv's favourite dishes is the Shrimp Stuffed Eggplant and this one was excellent. 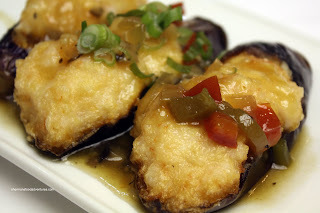 Completely overstuffed with shrimp mousse, the eggplant was fried perfectly so that it was tender without becoming mushy. Each piece remained in one piece, even after being cut. I liked how the black bean sauce was not too strong and with the addition of peppers, the flavour was more multi-dimensional. 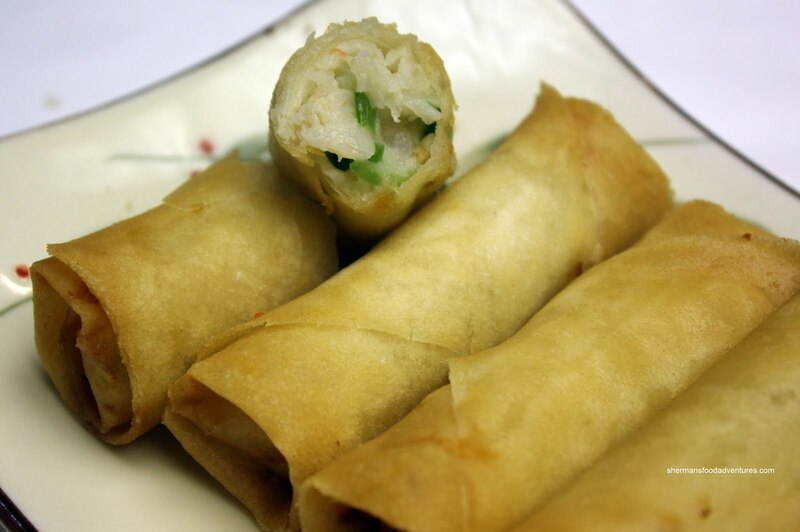 Another measuring stick for Dim Sum are the rice noodle rolls. We ended up ordering the Shrimp Rice Noodle Rolls. The noodle portion was a little on the chewier side; but the shrimp filling was both plentiful and cooked perfectly. Curiously, the BBQ rice noodle rolls are crossed off on the checklist. Guess it isn't a big seller? Another item we usually get are the Beef Meatballs. A pretty simple dish really. Just pureed beef mixed with starch, baking soda, seasoning, water chestnuts and onion (sometimes cilantro). 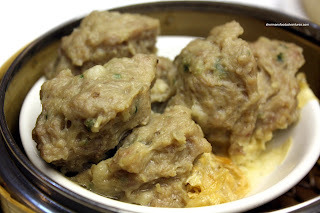 The trick to the beef meatballs is to achieve a smooth texture with a little bit of "bite". Some places fail when the meatball becomes mushy or too chewy. The ones here were quite good. There was the right balance of soft; yet retaining the "bounce" to the meat. Also, there wasn't copious amounts of onion which can overwhelm the meat. One dish that I rarely order at Cantonese Dim Sum is the Xiao Long Bao. It never seems to come out right. 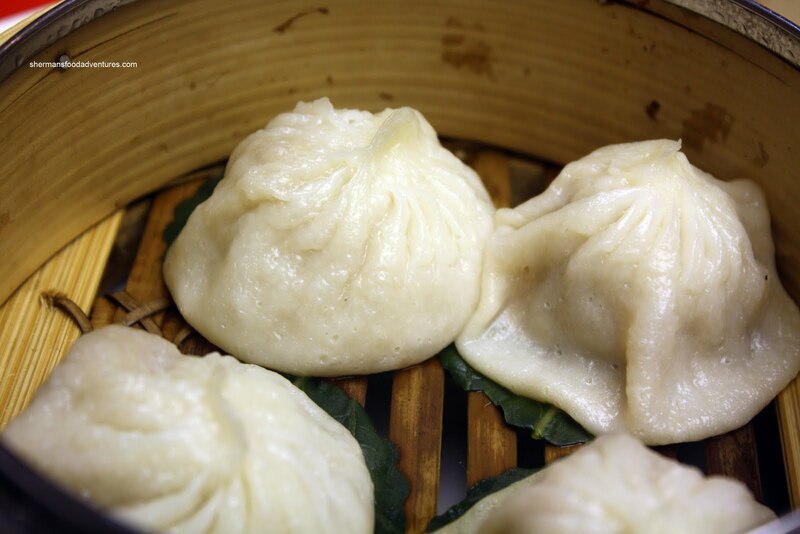 If I want my XLB fix, I go to Shanghainese Dim Sum. Sadly, this was the case here as well. 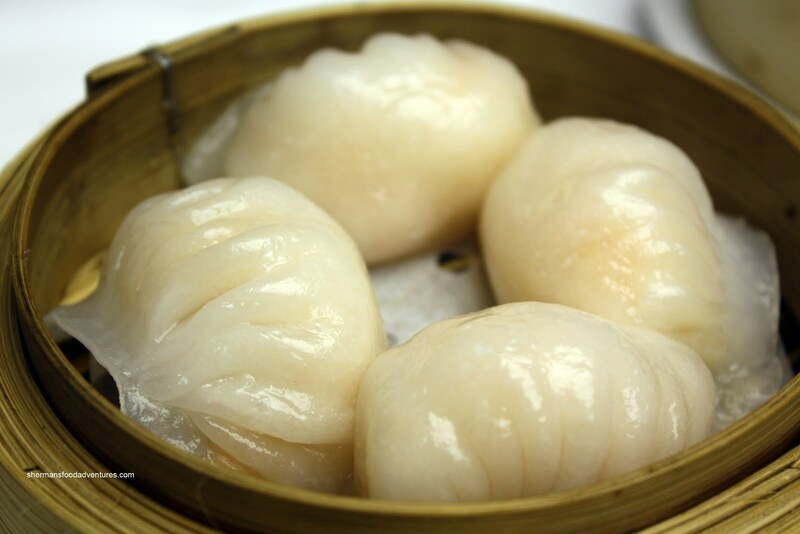 Containing very little juice and with a gummy dumpling skin, these were your typical Cantonese Dim Sum XLB. Don't get me wrong, these XLB were good to eat as a regular dumpling; but they were not XLB. We got my son's favourite item at Dim, which are the Shrimp Spring Rolls. However, he only eats the crunchy spring roll wrapper only. Fine, I get the shrimp, seems like a good deal to me! Once again, they were filled with properly cooked shrimp while being crispy and not oily on the outside. I only wish that they did not add green onion to the filling. I found that it detracted from the natural sweetness of the shrimp. Yet again, another classic Dim Sum dish is the Steamed Spareribs. I liked how most of the pieces were of actual rib; rather than cartilage. 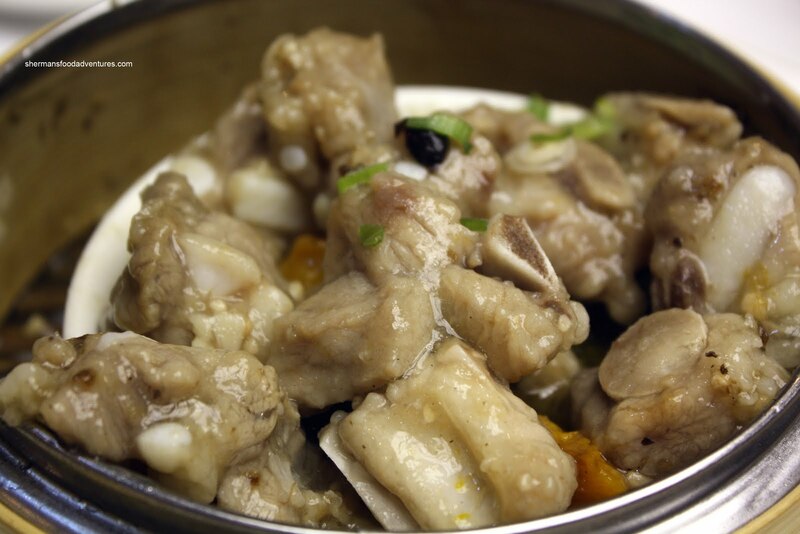 The pieces around cartilage are normally less tender and sometimes even quite fatty. The meat had the right texture of being soft enough to chew while still being chewy. Although I found it a bit on the saltier side. Another dish for the kiddies was the Pan-Fried Soy Rice Noodle Rolls. 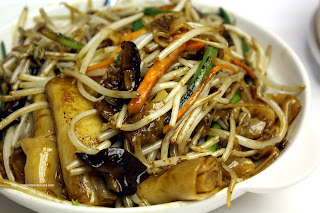 I didn't particularly like this version since it gets all cluttered by the sprouts, mushrooms, carrots and green onion. What it ultimately ends up being is a stir-fried noodle dish. I'm sure some people like it. I for one do not. Even grabbing a piece to dip into the hoisin or sesame sauce is a chore with all the other things clinging onto the noodles. With that being said, the noodles were quite oily; but with a good texture nonetheless. 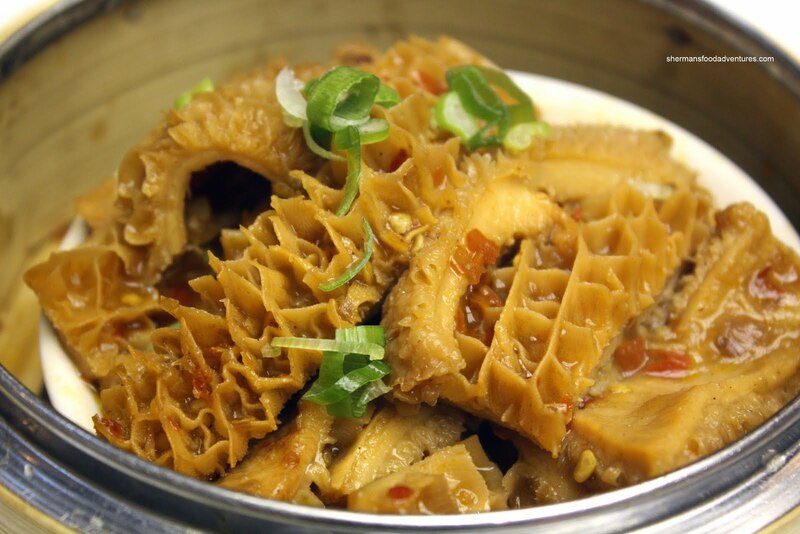 Ah yes, one of my favs, Beef Honeycomb Tripe. It always seems like I end up eating the whole thing. What do people have against tripe? I guess looking like the way it does doesn't help. Well, the tripe was prepared correctly here. There was practically no gaminess and the texture was a good balance between tender and a touch of chewiness. It was aggressively seasoned being mostly sweet with some savoriness. 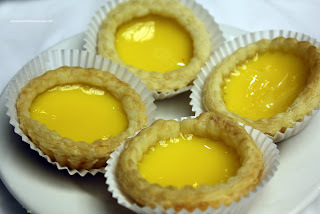 Ending off the meal were the Egg Tarts. We were warned that it would take 30 minutes since they only serve them fresh. And fresh they were. Flaky with a semi-sweet egg custard filling, these delivered. And really, that is pretty much the story of Kam Wai. It really delivered, in the most unlikely of setups. I wasn't expecting much and it exceeded my expectations. 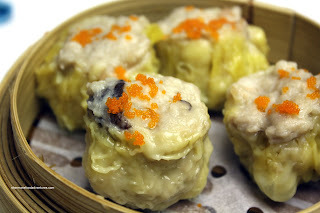 Although inexpensive, I wouldn't say the Dim Sum is any cheaper than places like The Roc; but if you really must have Dim Sum in Chinatown, skip Floata and stroll down to Kam Wai. We now not only have Chinatown #2 in Richmond, it's more like an Asian City. I swear, it is the only place in the GVRD that I can totally forget I'm in Canada. Of course, they have the ambiance, style and staff to justify the costs. Actually Kim, my comparison to the Roc was in price only. While the Roc is $2.25/dish, Kam Wai is at least $2.75/dish, thus it is not as cheap as some other places considering its location and style. It's still inexpensive for sure, just not necessarily the cheapest place. I still think it's worth it. Yah, sometimes the ambiance, style and staff lead to the costs not necessarily justifies it; but again, just stating the obvious why some places charge more. Also looking for a place to go for dim sum in Chinatown (I am car-free and like to walk there from the West End) I finally made the stroll out to Kam Wai today. I agree with Sherman (as usual) and am adding this place to my list of inexpensive, reliable, and friendly places to go and eat at. I'll be surprised if I'm not there again in the next two weeks. Thanks for the kind words! Yes, I'll be returning to Kam Wai as well. Nice little gem. I went there in September and we really enjoyed it. We did order a lot of food but most of it was worth it. We tried something we had never seen before being from Montreal and since we like to try new things we ordered it. I think it was the greed onion pancake. I did not finish my part. Something I really enjoyed was the steamed Shanghai juicy pork buns. I had never had it before and we were pleasantly surprised. I think I kept passing it before when I'd see it on the cart. For us it was inexpensive since most dishes here are $3.50 -$3.75. MTH, I'm glad you enjoyed it! Such a gem in Chinatown! Sadly, they closed down their dimsum restaurant and moved their well-established frozen dimsum business in. This location now only sells a few instant steamer items, plain congee and a couple of simple steamed rice dishes. this was my fave downtown haunt... no more.